Happy Valentine's Day, everyone! 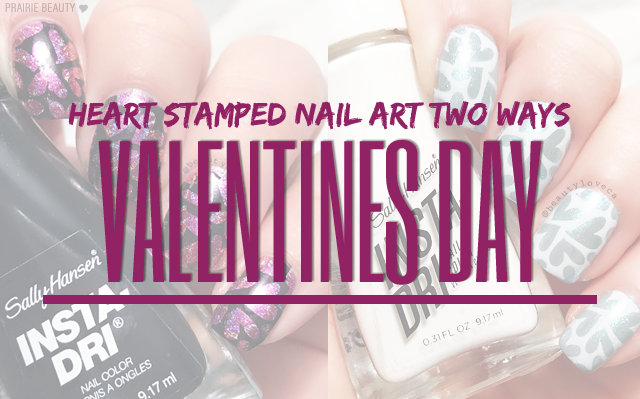 I wasn't planning on doing any Valentine's Day content this year... but then I did some themed manicures and decided... Why not? I'm actually a pretty big fan of Valentine's Day. I like the idea of one specific day a year to celebrate relationships, spend time together, and make your partner feel special. Sure, you could do that any day, but life gets pretty busy and we can all get caught up in the day to day, so sometimes it's nice to have a day set aside for that. Anyway, my beauty expression of my Valentine's Day love is, of course, on my hands. 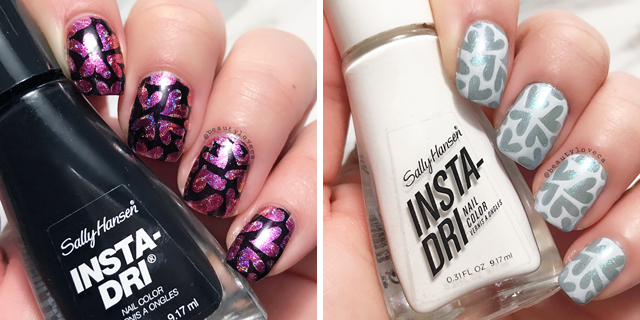 To see two the-same-but-different nail art looks I did this past week and how I got them, keep reading! To achieve this nail art, I started with 2 coats of Cover Girl Pyro Pink, which has been in my collection for absolute ages, and then topped it with Revlon Pink Glaze to give it a little something extra. Next, I added squiggly lines using Color Club Cloud Nine holographic polish and the Pueen stamping plate pictured below to give it a little bit more extra. 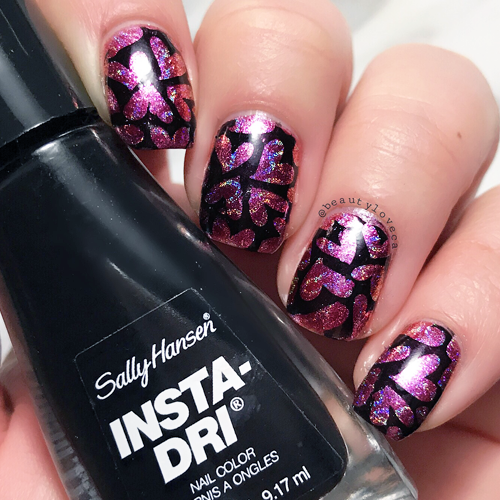 Finally, I used the heart stamp from the same plate and Sally Hansen Insta-Dri Back To Black and finished with Seche Vive Top Coat. I actually wore this mani for nearly a week and it looked gorgeous the whole time. When I sat down to do my nails again after taking off that first mani, I couldn't resist using the same plate and doing something similar and yet... completely different. I started with two coats of essie Treat Love & Color Indi-Go For It! * polish. Next, I decided to reach for a nail powder that I actually hadn't ever used before. I believe I got it from eBay right when nail powders were becoming a thing and then never really got into it. Anyway, I absolutely love that it took the blue and turned it more green and gave that really fine shimmer to the nails. 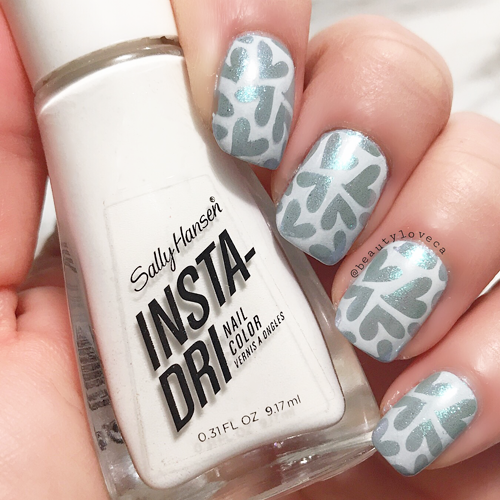 I decided to keep it simple from there and just added the same heart stamp, this time using Sally Hansen Insta-Dri in White On Time and finished with Seche Vive Top Coat. 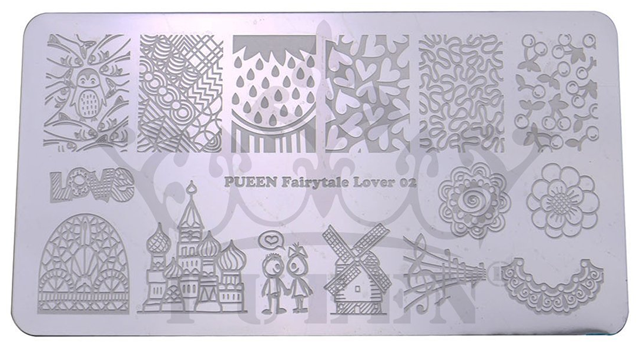 I used the PUEEN Fairytale Lover 02 stamping plate for both of these mani's and I really, really love it. This plate is actually fairly new to my collection, but I think it works really well and I have every intention of picking up a couple more stamping plates from PUEEN in the future - especially since they're available on Amazon Prime, which always makes me more likely to order things. I have a feeling this one is going to get a lot of play. I love that even though these looks were created using the exact same stamp, they're very, very different in their mood and general look. I hope you enjoyed this post - I'd love to hear in the comments whether you'd like to see more nail content here on the blog. I quite enjoy doing it, so it might become a more common thing in the coming months. Thanks for reading and Happy Valentine's Day, friends!